Cycling in Hampshire is blessed by countless beautiful routes through rolling, gentle and sometimes steep, green countryside for all states of fitness and ideas. Chalk downland, woods and farmland. Pretty villages with their chuckling streams and thatched cottages abound. Ancient towns and cities tell the history of the country, not just the county. Our children are special and they do love cycling. Many routes have the odd hazard and children should be kept safe. Check the route before you suggest it!!! Have Fun!!! Warning - this is a long page, please keep scrolling, there is so much of interest to all cyclists. Hampshire has so much. Some very useful town cycle maps to download and print. Basingstoke, Fareham, Gosport, Southampton, and Portsmouth. NCN 2, the route that, when it is eventually completed, will run all along the south coast from Kent to Cornwall. Should be good! It has some opened sections in Hampshire The trail starts in the North Mundham area in Sussex, skirts Chichester, along the main road though Fishborne to Bosham. In this area is an alternative loop though minor roads instead of continuing along the main road. Once again along the main road to Nutbourne and Southborne to Emsworth and on to Havant. Then through Hayling Island, along the front at Southsea . Over the ferry to Gosport on to Lee on Solent and the River Hamble. From the opposite bank to Netley Abbey,and across the River Itchen to Southampton. and wend its way through the beautiful New Forest to Lyndhurst. Some of the cycle paths along the NCN 2 can compete with traffic and are not at all safe for children. Even adults get problems along the way! Southsea front in particular is confusing for cyclists, motorists and pedestrians. It would also be a good idea to get the NCN2 map from Sustrans or consult their website for this route. NCN 22 eventually will link London with Portsmouth, then Brockenhurst via the Isle of Wight. Will be a nice ride. In Hampshire it is open from Batt's Corner, south of Farnham and Banstead. 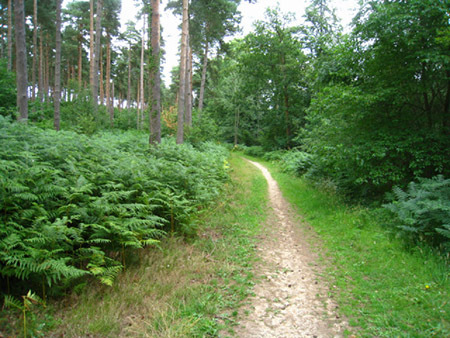 The route takes you through the delightful Alice Holt Forest, good spot for a picnic. Also there is a small section open on this route from Havant to Portsmouth. The section from the Alice Holt Forest to Portsmouth is known as the Shipwrights Way. NCN 23 is the Reading to Sandown cycling route. Not all is open yet but quite a few parts are. From the Hampshire border the route runs to Basingstoke, a distance of 22 miles. From there the route runs to the link to Alton and Alresford across the rolling chalk downs. The route to Winchester is open. From there to Eastleigh and then Southampton. The Isle of Wight section from Cowes via Newport to Sandown is open. Via the ferry of course. NCN 24, runs from Eastleigh at the junction with NCN23 over the county boundary into Wiltshire and the lovely city of Salisbury From there it runs to Somerset and the interesting port city of Bristol. The National Byway. This one is 3,300 miles long!! All round England, parts of Scotland and Wales. In Hampshire this centres on England’s ancient capital, Winchester, not surprisingly. Cycle routes extend out westwards in two loops, the northern loop via Salisbury the southern through Dorset to Shaftesbury. An eventual route will leave Winchester and extend eastwards to Canterbury. South Downs Way. 100 miles, 3 day cycling break, of beautiful trail from Winchester in Hampshire to Eastbourne in Sussex. Also a trail for walkers and horse riders. Starting point is the National Trust property of City Mill in Bridge Street, Winchester. Ends at the western end of the Promenade at Eastbourne. 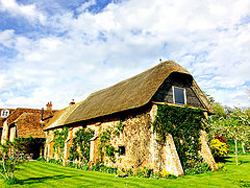 Stunning - entirely within Areas of Outstanding Natural Beauty. Passes over both Butser Hill and Ditchling Beacon. The South Downs are a National Park. East Hampshire. 22 miles. Circular cycling trail through an Area of Outstanding Natural Beauty. Starts and ends at the Petersfield Railway Station. Some very steep climbs and wonderful views. Because of some hazardous crossings children should be accompanied. Lindford to Alice Holt. Six and half miles. The linear cycle route starts at the junction of the B3004 and B3002 at Lindford and runs through countryside and through part of the Alice Holt Forest. Not recommended for children under ten and with a few hazards, older ones should be supervised. Alice Holt Forest makes a good picnic spot. This is the wish you were here country of the Test and Bourne Valleys, so heart achingly beautiful whatever the season. There are so many lovely rides in this magical part of the county that they deserve a page of their own. Check out Cycling in the Test Valley for more information. The rides are for all abilities from Very Challenging to Easy and Family Rides. Cycling in the New Forest is lovely in all seasons. See the ponies, perhaps if you are lucky the deer. The trees leafy in summer and stately bare branches in the winter reaching to the sky. It is not all forest, heathland and grassland bring change of scene and different wild life. This is such a special area that the rides have a page of their own. Hampshire County Council have leaflets online to cover these routes. Download and print them all - why not! Put them in waterproof covers and take them with you. Makes for some great days out. Some of these trails link with others, so there is some quite varied days out can be organised! Cameras and binoculars are a good idea, some of these routes have some stunning views, particularly the strenuous ones. Ox Drove Off Road Cycle Trail, 25 miles of strenuous cycling and is also a horse riding trail. Circular from Abbotstone Down Car Park, two and half miles north of New Alresford on the B3046. Beautiful chalk downs. Whitchurch – Watership Down country. 23 miles of which 14 are off road on a circular route. Strenuous riding. Passes through the downs that inspired Richard Adams to write his popular book, Watership Down. Area of Outstanding Natural Beauty. East Meon. A somewhat challenging 10 mile ride, 7 off road. Starts and finishes at the Butser Hill car park in the Queen Elizabeth Country Park. Views from the top of Butser Hill are brilliant and the Meon Valley is lovely. Take the camera. Cheesefoot Head. 19 miles and all but two of them are off road. Begins at Cheesefoot Head car park on the A272, only two miles outside the county city of Winchester. The Head is an area of Scientific Interest and a beauty spot on the South Downs Way. Another trail where a camera and maybe the binoculars might be an excellent inclusion! Plenty of exercise with the magnificent compensation of excellent views. Winchester off road cycle trail. 26 miles. 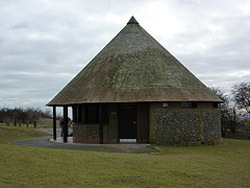 Starts and finishes at the Cheesefoot Head car park on the A272, two miles outside attractive Winchester. There is a useful alternative start in Winchester itself at the Railway Station. Tough going on the outward trail and a bit easier on the return. Plenty of photo opportunities with spectacular wide sweeping views. Farley Mount. A challenging 14 mile route with less than half off road. There are a couple of short cuts that take the ride down to 12 or 13 miles. The ride begins and ends at Crab Wood car park in Farley Mount Country Park on Sarum Road. Woodland and downland ride with the villages of Farley, the Sombornes, and Sparsholt. Danebury. 24 miles of which 15 are off road. There is a short cut route of 15 miles. Starts at the Danebury Iron Age Hill fort car park a couple of miles west of Stockbridge. There is an Iron Age Museum in Andover which would merit a visit before visiting Danebury, lots of artefacts. Some tough going, some quite easy. 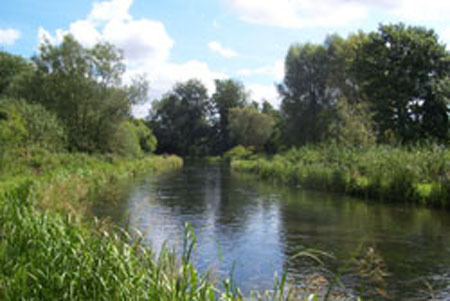 The easy bit is along the Testway cycle trail by the lovely River Test. Watership Down. 17 miles, 9 of which are off road. Circular cycling trail, begins and ends in the Anchor Road car park in Kingsclere. There is a short cut trail of 11 miles. This challenging ride takes in the beautiful countryside of Ladle Hill and Watership Down where Richard Adams set his delightful children’s book. For a while the trail travels along the Wayfarers Walk. Plenty of hills and lovely scenery. Vernham Dean. 23 miles of which 9 are off road. There is a short cut trail of 16 miles. This one starts very usefully at the Andover Railway Station. Picturesque route if rather rolling and challenging. Hills bring views and this trail is no exception. Plenty of very pretty villages. Petersfield. This one will sort out if you are fit or not!!!!! Tough going. 15 miles, 7 off road. Starts and ends at Petersfield Railway Station. Scenery is magnificent. Take the cam corder – makes a convenient excuse for a stop! 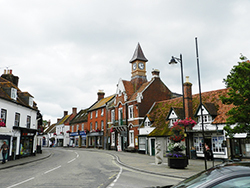 Fordingbridge. 21 miles of which 12 are off road cycling. There is a shorter trail of 14 miles. Starts and ends at the Fordingbridge pay and display car park. One for the experienced and fit cyclist. The full trail passes Martin Down National Nature Reserve. The short cut passes the Roman villa at Rockbourne. Abbotstone Down to Abbotstone Down,18 miles with 14 of them off road. So special in springtime. A ride amongst the lovely chalk downs and woods in a landscape that has prehistoric connections. Newfound to Newfound via Overton. (The leaflet has Basingstoke as the title, but it starts at Newfound.) 17 miles off road. This bike ride can start at the Fox pub at Newfound on the B3400 or handily at the station at Overton which has South West train connections. Not a difficult ride through charming Hampshire countryside. Overton is a large village, almost a small town. Sparsholt. A 25 mile ride of which 16 are off road. The start as well as the finish is in Farley Mount Country Park at the Crab Wood car park. The Park is about two and half miles on the west side of Winchester on Sarum Road. Open country, woods, little villages and the hills are not too bad. Pleasant ride. Ellisfield. 13 miles, 9 of which are off road. Cliddesden, the start, is a mile south of Basingstoke, alongside the pond in Church Lane. Alternatively start in Basingstoke and cycle via Brighton Hill, not far. Countryside ride through fields and woods. Peaceful. The Candovers. 16 miles, 5 off road. Starts and ends at Micheldever Woods car park. 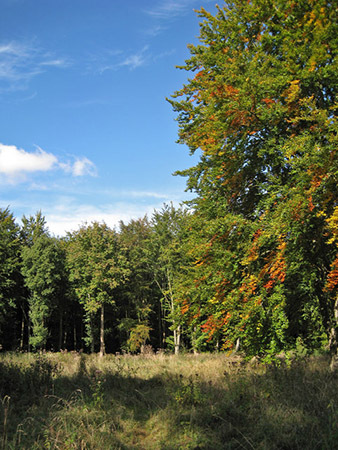 Micheldever Woods area has been inhabited since prehistoric times and the woods were probably planted by the Saxons. If you fancy a walk before the ride, there is a waymarked archaeological trail which starts in the car park. No cycles in the woods. The villages of Micheldever and East Stratton are picturesque. Horndean. South of the county. 14 miles of which half are off road. Shorter trail of 9 miles. Starts and finishes at the Denmead car park between Hambledon Road and Kidmore Lane. Runs for a while along the South Downs Way. Small towns and countryside. Alton. 10 miles of which 7 are off road. 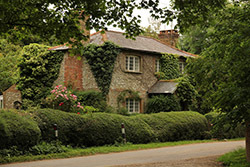 Starts and finishes at Chawton Park Wood, Boyneswood Road, in Four Marks, not far from the A31. Woods and open fields. Jane Austin lived in Chawton. Liphook. 9 miles, 6 off road. Starts and ends at the Liphook Railway Station. An attractive route that passes through woodland, through the villages of Bramshott, where there is a War Cemetery with Canadian graves from WWII, and pretty Conford. Tbere are two leaflets here, the second is a correction to the map so you need both. Queen Elizabeth Country Park. 10 miles with 8 of them off road. It is the 6 mile short cut that is suitable for families, otherwise moderate. The Park is signposted from the A3, four miles south of Petersfield. Chalk downs, forest, lovely scenery. At the forest entry just past Ditcham there is a very steep slope, might be a good idea to walk down! Testway Cycle Route. Family ride of 5 miles in each direction between Stonymarsh car park on the A3057 to Stockbridge along an old railway track. 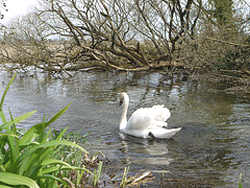 Stop for some bird watching along the river and passing through the Nature Reserve. Delightful. Lepe. 9 miles of which 3 are off road. There are two shorter trails, one of 7 miles and one of three and half miles. Starts and ends at the Lepe Country Park car park, Fawley. Lepe Park is lovely, right on the coast with views across to the Isle of Wight . The ride itself is not for children as there are a few hazards. Hayling Billy. 5 miles, all off road. Linear cycle trail. Starts at the car park at the back of the Esso garage at North Hayling Halt on Havant Road in Hayling. Walkers and horse riding trail as well. Wheelchairs in summer time. 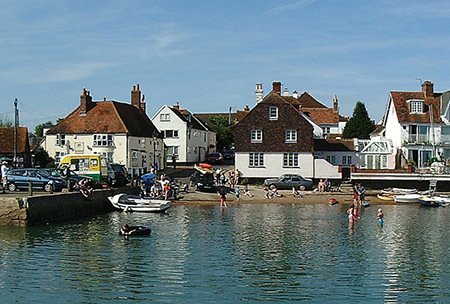 Runs along the eastern side of Langstone Harbour a site of Special Scientific Interest. Waterbirds abound. Beautiful.The trail ends at the junction of Station Road and Sinah Lane in West Town. There is a beach here for a relaxing stop before going back. If your destination is Portsmouth the ferry is at the western tip of the island, not far away. West Wood. A short one, only three and half miles. Starts and ends in the Hawthorn car park at Farley Mount Country Park. This is a pretty ride through woodland, all off road within the country park. Or you may prefer to browse some more, please do, there are navigation buttons above on the left.